The March 5, 2018, deadline to end DACA Amnesty as Trump promised has come and gone. DACA Amnesty protections for illegals remain in effect through Trump, and they are continuing to issue protections to new illegal immigrant applicants. Candidate Trump promised that illegals must go home as our laws require (Lie). He promised to end DACA his first day in office (Lie). He promised to end DACA Amnesty on March 5, 2018 (Lie). He told us he opposed Gang of Eight style Amnesty bills (Lie), then he tried to pass one last month! He promised to enforce our existing immigration laws for many years before even discussing remaining illegals (Lie). While it is true that two activist judges have issued injunctions to sustain the DACA program, they have no jurisdiction or power to require a duly elected President not enforce our existing immigration laws, especially not for something such as DACA memos from a prior President. The only person responsible for the lack of immigration law enforcement and continuing deaths and injuries caused by illegals on U.S. soil at this point is President Trump. Yesterday, 87 pro-DACA Amnesty protesters were arrested breaking more laws in Washington, DC. Many are illegal aliens who have no fear of existing U.S. laws, no fear of our law enforcement agencies, nor our top law enforcer Donald J. Trump! They know they are a protected class and show it on every level! They can be above our laws thanks to unlawful and unconstitutional protections emanating from Trump's White House! 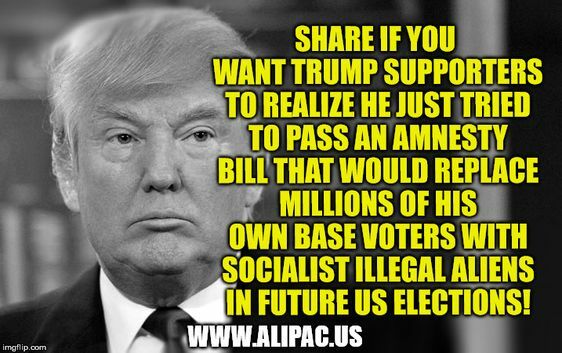 On ALIPAC's social media pages, so many Trump supporters are desperate to rationalize this all away. They say the Democrats are to blame, yet no Democrat is in charge of America's existing laws and our federal law enforcement agencies. Trump is. They say a federal judge is stopping him, yet a Federal judge in Maryland said today Trump can end DACA, but he has not done so! It is time for all Americans to come to terms with the fact that Trump lied profusely to win the Presidency, he has betrayed his core support base, and only through accepting these facts can we have any hope of successfully fighting back to save America. Only by dealing with the truth to the best of our knowledge can we stand a chance. The truth is that while I oppose almost everything Hillary Clinton stands for politically, at least we all knew she supported Amnesty for illegal aliens. And while her Presidency would be a tyrannical terror for us all, it is disappointing to have to admit that Hillary Clinton and all of her lies and deception was more honest than the current President who lied about his positions on immigration, illegal immigration, and Amnesty. So many Trump supporters still do not realize, or refuse to admit, that President Trump just tried to pass a nation destroying illegal alien Amnesty bill that would have replaced millions of his most dedicated base voters in future U.S. elections with socialist illegal aliens! Please take a few minutes to share this message by e-mail or by sharing this meme below because more Trump supporters need to be willing to stand up and hold him accountable for these lies, deceptions, and reversals on his most important campaign promises. Some Trump worshipers will never do that, just like the 17% of Republican voters that stood with GW Bush till the end of his second term, but we need to do our best to accurately inform Americans about what is really happening even if they misplace their anger at me as a messenger. Anyone who is upset with me for saying these things needs to realize that I am not the one who lied to the nation and I am not the one abandoning my responsibilities to enforce the existing laws of the USA. That is all on Trump, and I am staying true to myself and those who have supported ALIPAC for years by calling it as I see it! Last edited by imblest; 03-06-2018 at 12:00 PM. artist, Scott-in-FL, GeorgiaPeach and 4 others like this. I am so disgusted with Trump over this!!! ALIPAC, Beezer, GeorgiaPeach and 2 others like this. President Trump keeps bringing up DACA. This is a cry out to the rest of the world to come, to hurry up and get here. And they are coming. It is also a slap in the face to the rule of law, to supporting the lives of American citizens. When the president first won there was serious concern by those who would come illegally that things were changing. Then the president broke his promise to end DACA day one and he did an about face with his love talk toward those here illegally. The numbers increased again and they will continue. We also keep learning about different visas available to allow people to come, to bring spouses and families. Tightening up these many ways to enter and lowering the numbers is what the country needs for the dreams and successes of American workers and families. We do hear of immigration raids. However, the numbers are not acceptable to send millions out of the country through deportation or by their own fear and decision making because they believe our government is serious. The president should be publically warning employers and the illegal aliens themselves that illegal immigration will not be allowed, that businesses and individuals will be prosecuted for hiring anyone illegally, for aiding and abetting. The borders could be more secure. When tens of thousands keep crossing, you are not succeeding at an "America First" plan. Last edited by GeorgiaPeach; 03-06-2018 at 04:28 PM. artist, imblest, stoptheinvaders and 3 others like this. Quotation from article by Bill Gheen: "Candidate Trump promised that illegals must go home as our laws require (Lie). He promised to end DACA his first day in office (Lie). He promised to end DACA Amnesty on March 5, 2018 (Lie). He told us he opposed Gang of Eight style Amnesty bills (Lie), then he tried to pass one last month! He promised to enforce our existing immigration laws for many years before even discussing remaining illegals (Lie)." Thanks for composing the whole article, it is cogent and full of good talking points. It is a nice summary of the treachery of Mr. Trump. So many people refuse to look in the mirror admit they are being played for fools. Trump must be held accountable when he does wrong, protecting him no matter what he does is self-defeating for those who want to Make America Great Again. We must make it clear he only has our support as long as he keeps his most important promises or works hard to fulfill them. Trump will respond to pressure; he must respond to pressure. If conservatives support him no matter what he does, the only pressure he will get will be from the political left and therefore he will seek to appease them to our determent. We must tell those who support him no matter what he does, that they are underling the whole effort to turn this country away from the illegal immigration disaster. They are hurting themselves and everybody else. We must be united to maximize the heat he will feel when he goes astray or attempts to manipulate us. We will not be fooled. Then and only then will he listen to us and act accordingly. Thanks again Bill, good article. Last edited by 17patri76; 03-06-2018 at 06:17 PM. stoptheinvaders, ALIPAC, imblest and 1 others like this. I knew Trump was shaky going in and I had said as much. However, even I didn't believe he would offer to amnesty millions of illegal in his first 12 months of office. Very disappointed. stoptheinvaders, artist, imblest and 1 others like this. I am trying to be sympathetic to my attackers because I understand how much it would grieve them to accept this truth I've placed before them. And, I know they feel desparate and surrounded by enemies because they are. And... they have been lied to so much they don't know the truth when they see or hear it anymore. But I'm sticking to the truth as I see it as I always have through thick and thin. Please know how much I appreciate all of you here and your supportive comments. imblest, MW, Beezer and 1 others like this. I call the White House every day. It should be part of our daily routine. When practical start your day with a call to the White House and remind Donald (The Mouth) Trump of his treachery and inform he him, he has lost your support until he starts deporting DACA and commits himself to veto any legislation that will allow them to stay. Sometimes you can not get through on the comments line at the White House (1 202 456 1111). If you get a busy signal don't wait, it will simply disconnect you after a while. If you get a busy signal at the "1111." use the White House switchboard number 1 202 456 1414 and tell them you are against DACA, where upon they will connect you to the comments line. It has the added advantage that the general switchboard operator will hear about opposition to DACA. Every day if possible, or as much as possible. Give Donald (Benedict Arnold) Trump no rest. Last edited by 17patri76; 03-06-2018 at 06:36 PM. ALIPAC, imblest, Beezer and 1 others like this. THANK YOU "W"...WE NEED YOU AND WE APPRECIATE ALL YOUR HARD WORK! ALIPAC, imblest and stoptheinvaders like this. Patriots some advice: If you can, call the White House every day or as often as you can. I have had better success making a connection to the comments line by going through the White House general switchboard 1 202 456 1414 the operator will then transfer your call to the comments line. Often calling directly to the comments line at 1 202 456 1111 will only get you a busy signal instead of a connection and after a while it will simply disconnect you without connecting you to a comments line operator. If you do not immediately get connected when directly calling the comments line, use the general White House switchboard that should work well. Be sure to tell the operator Trump has lost your support and will not get it back until he starts deporting DACA squatters and commits himself to veto any legislation allowing DACA illegal alien squatters to stay. Be clear, they must leave, no deals, they must all be deported. Last edited by 17patri76; 03-06-2018 at 06:58 PM. Beezer, imblest and stoptheinvaders like this. The next "round table" Trump needs to have is one with the President of Mexico and the President's of Central America. Tell them to bring their Comprehensive Plan for Reform and the plan to take ALL their illegal aliens back and keep them on THEIR soil. UNTIL THEN...CUT OFF EVERY DIME OF FOREIGN AID, STOP BUILDING THAT NEW EMBASSY AND TURN THEM RIGHT BACK AROUND AT THE BORDER. RAMP UP DEPORTATIONS! THROW OUT THEIR LYING "ASYLUM" CASES AND GET THEM OUT OF HERE! GO HOME AND CONTRIBUTE THE SUCCESS OF YOUR COUNTRY...NOT FLEE LIKE COWARDS AND TAKE FROM OTHERS!